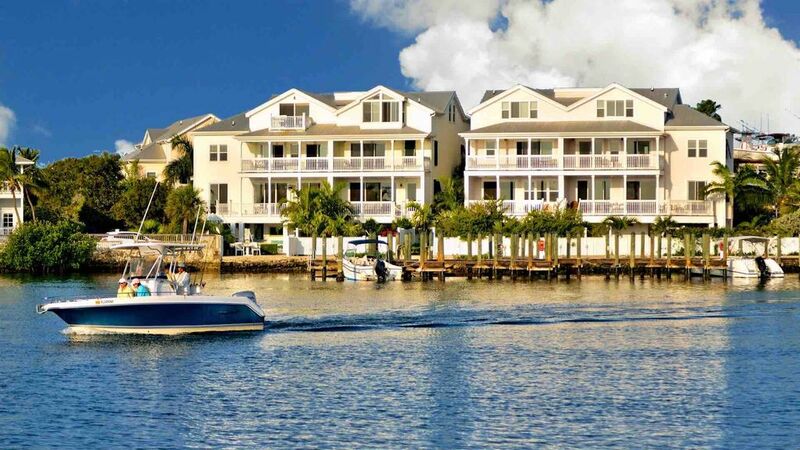 "The Commodore's Manor" is a beautiful 5 bedroom 3500 sq ft town home that is located directly on the water at Garrison Bight with direct access to Florida Bay. "The Commodore's Manor" @ Paradise Harbor has everything you'll need while you're in Key West: luxurious accommodations, a dramatic water view from every floor, a private pool, your own boat slip, and even a 2 car garage. You'll have your own little world, but you'll also be walking distance from all the restaurants and attractions of Old Town. On the ground floor you'll find the large 2 car garage and a covered dining area near the pool. You can take the stairs or the elevator to the first living level. As you enter "The Commodore's Manor", you'll be struck by the openness and light with sunlight streaming in from the sliding window walls that open to the large porch. The living area has plenty of room for everyone with a large high-definition TV and a queen sleep sofa for extra guests. The kitchen is fully equipped with the best appliances available and is quite large, with plenty of room for the family chef (and kibitzers). Just a few steps from the back porch is the private pool which is elevated for a better water view. You can also elect to have pool heat for $20 per day. There is an expansive patio and even a sheltered dining area. You can access the dock and your own private deep water boat slip via the back gate, which is lockable. The dock is equipped with a fish cleaning station. >> First Bedroom: Two Twins OR One King bed, a flat screen TV, a walk-in closet, and an en-suite bathroom with a walk-in shower. >> Master Suite: King bed, flat screen TV, private balcony, and an en-suite bathroom with double sinks, Jacuzzi tub, and walk-in shower. >> Third Bedroom: Queen bed, flat screen TV and an en-suite bathroom with a shower and tub combination. >> Fourth Bedroom: Two Twins OR One King bed, flat screen TV, and access to the shared full bathroom in the hall with a walk-in shower. >> Fifth Bedroom: Four Twins OR Two King beds, flat screen TV, and access to the shared full bathroom in the hall with a walk-in shower. This is definitely one of the nicest houses in Key West. Private pool, patio, BBQ, boat slip, and right on the water. There is more than enough room to accommodate a large number of guests. My friends and I had an amazing time and will definitely be staying here on our next visit. amazing location, amazing amenities. overall a great experience definitely worth it! We had an awesome weekend stay at the house. There was a group of 11 of us and everyone loved the house. Shel, our Guest Services Coordinator was amazing too. He was always just a phone call or text away and was able to work with us on our check-in time. The house is gorgeous with a great balcony that your whole group can hang out on and a pool that we got plenty use of. Would highly recommend this place for a larger group. Great location and stunning house. We stayed for 3 nights in mid-February and loved the house. It was in a great location with quick access to all parts of Key West! We enjoyed the heated pool and all of the other house amenities. The house was well-equipped and very clean and well-maintained. Shel, the property manager was excellent and added a special touch to our stay! Highly recommended! Great Place, Great location, Great management. Very clean with a great view! Beautiful property with plenty of space. Great view and the pool was just right.